Dana Schutz, who is in her mid-30s, belongs to the generation of artists who grew up in an epoch where painting was routinely thought of as a dead practice. One couldn’t just be a painter, because doing so would be to enter a dusty domain crammed with empty signifiers. It would mean you were doing something that was obsolete (and reviled) — like speaking Latin to the drugstore cashier. The lines were pretty clear: dumb people became painters; smart people became conceptual artists who painted only when and if the subject called for it. This viewpoint might have started out as speculation, but now it’s a stupid and persistent prejudice. Instead of accommodating herself, like a good student, to the pressures of the historical moment, Schutz turned the tables. If painting was no longer possible, then what would it mean to depict the impossible in bold colors and clear forms? At once macabre and funny, her early painting “Face Eater” (2004) joyfully defied the doxa, the repressive discourses demanding conformity. 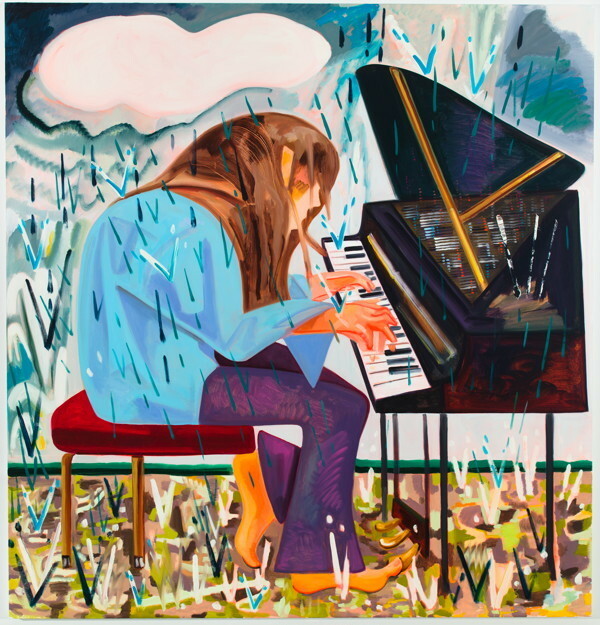 The image of a young woman with long brown hair playing a piano in the rain might initially seem like a metaphor for the absurdity of painter’s situation, but it’s not. For one thing, the image evokes Walter Pater’s statement: “All art aspires to the condition of music.” Music shapes time without needing to resort to narrative or reference. This state of self-sufficiency is what Wassily Kandinsky and Frantisek Kupka wanted to attain in their art. It would seem Schutz also wants to achieve this state but recognizes that it is impossible; the rain intervenes, messing up the otherwise ideal situation. Here is another line of inquiry: Is the young woman playing something “original” or is she “interpreting” someone else’s music? What does it mean to be original if you are a pianist? Are you appropriating someone’s music if you play it? Are there clear distinctions between originality and appropriation? Or one might consider these questions: What is the meaning of rehearsal and repetition? Is there a correlation between a pianist’s daily engagement with her art (practice and play) and that of a painter? What is the meaning of skill and its opposite, de-skilling, in this context? Correspondingly, the absurdist situations that Shutz depicts as embodiments of the painter’s predicament inform us of the extent to which her inquiry is motivated by a philosophical disposition. 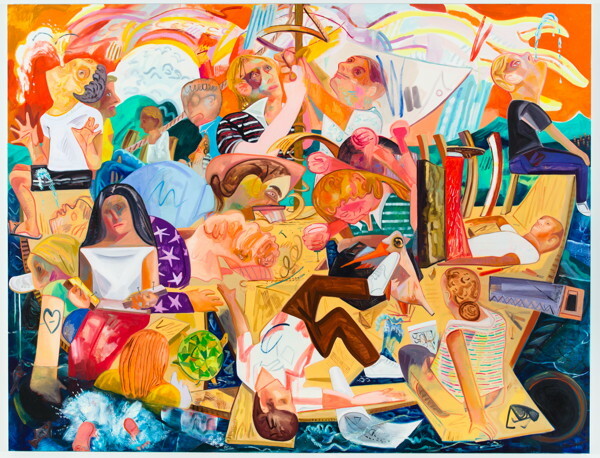 In the largest, most crowded painting in the exhibition, “Building the Boat While Sailing” (2012), Schutz’s deft manipulations of space could serve as an instructional manual for art students. In the lower third of the painting, from left to right, she depicts four figures, each of which activates the surrounding space differently. On the far left, a woman sits on the edge of the raft (an irregularly shaped geometric board tilted away from the picture plane), facing out. She holds two pieces of wood, each pierced by two nails, as if they are cymbals. Although her shoulders, head, and hair are largely flat shapes, they come across as solid and weighty. Beside her, but lower, is a woman in the water, presumably pushing the boat forward. Her head, shoulders, and white hand (abstract shapes) and the bottoms of her feet rise above the water. Unless the woman is shaped like a horseshoe, with her head at one end and feet at the other, the configuration is impossible. The third figure is an upside-down man — a position most likely inspired by a painting of Christ being lowered down from the Cross. Sprouting from the painting’s nether regions, the figure flattens everything out, even as the figures around him activate the space in individual ways. On the right, slightly angled in from the painting’s right edge, a woman seated cross-legged faces away from us, engrossed in what’s going on in front of her. If the boat (the painting) is a vehicle that is capable of transporting us (the viewers) elsewhere, then what does it mean to both build it and sail away at the same time? Perhaps the boat (painting) isn’t supposed to take us anywhere, that it has been doomed at least since the death of God. Does that make it as worthless to build as to deconstruct, which the figure boring into the wood (the bore is near the exact middle of the painting!) might seem to be doing? If you do both at once, does that mean you are a dumb painter rather than a smart conceptualist? There is a sharp bite to these paintings, but, as we all know, some bites can be enjoyable. This is what Schutz does so well — she asks questions that challenge the answers given by others. More importantly, she asks her questions by folding them into the painting. There is nothing extraneous, no overt or didactic message. We get everything in the work by unraveling it. There is no secret hermeneutical code we must possess to unlock the door. One question that Schutz addresses is the porous border between abstraction and representation. 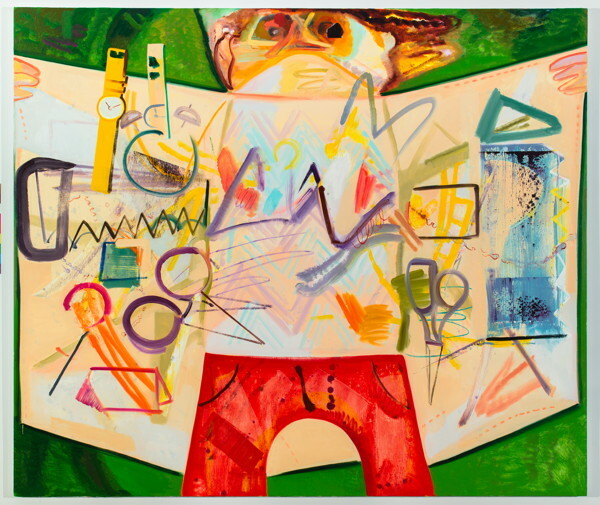 In “Flasher” (2012), a man opens his flesh-colored coat, which is indistinguishable from his skin, revealing a wristwatch, scissors, schematic eyeglasses, and an array of crosshatches — which allude to the ones Jasper Johns deployed in his “Corpse and Mirror” paintings — across his torso. The “Flasher” has exposed his marked, naked body, and it has turned out to be largely abstract. There is a disturbing pathos in Schutz’s work. A young woman holds a flame to her ear, while holding her index finger to her lips, as if lost in thought. She is so disconnected from her body that she doesn’t feel any heat from the flame. The colors are jaunty, while the face is impassive, a distant relative of Picasso’s depictions of Marie-Thérèse Walter. In the back room of the gallery, Schutz mounted five small paintings of a plump, almost featureless, young woman caught in the act of yawning. Given how many times each of us has yawned in public, the paintings seem to be having their revenge. They are bored by our constant know-it-all self-regard, and you can’t really blame them. Piano in the Rain continues at Friedrich Petzel Gallery (537 West 22nd Street, Chelsea, Manhattan) through June 16.